First of all I'm glad to have the opportunity to review another Jack Chaucer's book. I reviewed the first book entitled Streaks of Blue way back October 16, 2013 (review link is provided). I enjoyed that first book and this second one didn't fail me. I do like how the author writes because he isn't just creating a book but his works has a connection to the real world or the things that is happening around. This book focuses on Nikki's new life as an adult, the struggles, change of environment, jobs, money, relationship and many more things, but for me there are two factors that stands out, money and relationship. Money because Nikki gave up her internship when there were someone who offered he a new job with big deals. Relationship because she gave up the love of her life Derek due to her selfish decisions. The Nikki I met before who saved the life of many people changed in this book. She evolved from someone more not-so-Nikki. I can't blame Nikki for she has dreams of her own but what happened to her is the result of an unplanned decision. The book has it's lessons on his own which is really applicable to our own lives. You won't get lost in the story because this was different from the other one though it is a second book it can be a stand alone. I had a great time reading this, I had goosebumps because Nikki still wants to save somebody else life even her own is just like a puzzle. If the readers want something new and a life changing kind of book, I suggest you guys should read this book. It was worth your time, actually no matter how busy I am lately I managed to read and give time to finish this book. I always look forward to what the new chapter has to offer. Sometimes I just wish things were the way they used to be. I know it's hard when people you knew for years suddenly grow up and move on. Annnddd because of that... the author himself has a surprise for everyone.. He gave me a permission to this giveaway. There will be five winners for this blog review/giveaway. I'm the author of the YA novel "Streaks of Blue" (2013) and the adult sci-fi thriller "Queens are Wild" (2012). I live in Connecticut, U.S.A., with my wife and twin 4-year-olds. 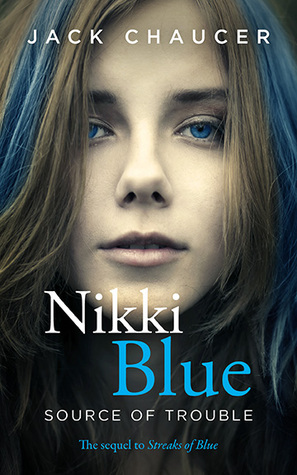 "Nikki Blue: Source of Trouble," the sequel to "Streaks of Blue," is slated to be published on Oct. 9, 2015. It's a new adult drama set in 2018-19. ARCs are now available on NetGalley!